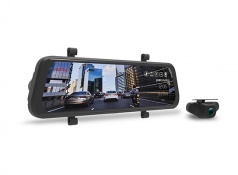 Introducing the Parkmate MCPK-962DVR Full High Definition Dual Channel Dash Camera Mirror with Reversing Monitor. 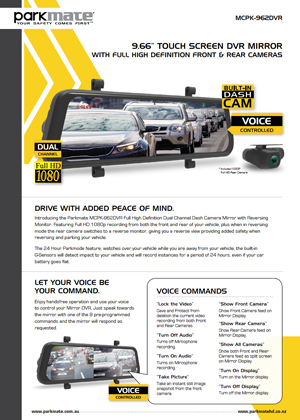 Featuring Full HD 1080p recording from both the front and rear of your vehicle, plus when in reversing mode the rear camera switches to a reverse monitor, giving you a reverse view providing added safety when reversing and parking your vehicle. The 24 Hour Parkmode feature, watches over your vehicle while you are away from your vehicle, the built-in G-Sensors will detect impact to your vehicle and will record instances for a period of 24 hours, even if your car battery goes flat.